Zinc Plated Carbon Steel + Dry Film Lubricant coating (MD) parts are suitable for installation in ductile panels with a maximum recommended hardness of 70 HRB. 300 Series Stainless Steel + Dry Film Lubricant coating (A2) parts are suitable for installation in ductile panels with a maximum recommended hardness of 70 HRB. Aluminium (AL) arts are suitable for installation in ductile panels with a maximum recommended hardness of 50 HRB. 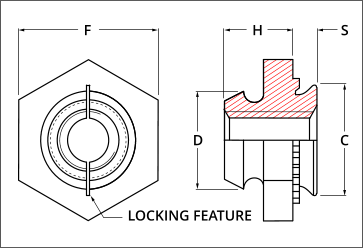 Self-Clinching Locking Nuts provide strong female prevailing torque locking threads in panels that are too thin to be conventionally tapped. Utilising a special proven clinch feature, this fastener has excellent torque-out and push-out characteristics whilst providing a flush finish on the underside of the panel. Featuring two symmetrically threaded jaws and a dry film lubricant coating to provide a strong and effective prevailing torque locking action to minimise the risk of loosening when under heavy usage. Like all self clinching fasteners they are installed using a parallel squeezing action, so require access to both sides of the panel. 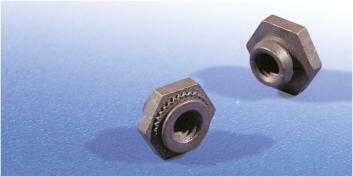 Locking Nuts are available in various thread sizes, manufactured from zinc plated steel and 300 series stainless steel plus a dry film lubricant coating and are suitable for installation in ductile steel and aluminium panels with a recommended maximum hardness of 70 HRB and aluminium with no dry film lubricant which are suitable for installation in ductile aluminium panels with a recommended maximum hardness of 50 HRB.